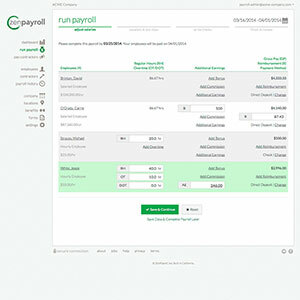 ZenPayroll automates everything about payroll. Tax filings, calculations, and payments are all taken care of, meaning you never have to worry about deadlines, fines, or inaccuracies. Top that off with a user experience that employees love, and we’re confident that ZenPayroll is definitely something you want to bring home to the family. Xero gives you all the tools you need to run your business. Their gorgeous, real-time charts give you actionable data, helping you make smarter business decisions. Add in tax calculations and simple e-filings and e-paying and we’re in love. If you’re running your business on QuickBooks already, QB Payroll is a great way for you to manage payroll on a software you already know and love. Getting total control over your financial data without worrying about manual calculations? It’s definitely more than a crush. Whether you go with ZenPayroll to completely automate your payroll needs, Xero Payroll, for more control over your data, or QuickBooks Payroll to upgrade your current suite, we’ll be here to join your expenses and accounting data in perfect union. Already in love with an accounting service and looking for a way to streamline your expenses? Sign up for a free trial or learn more here.